There are many different definitions of stress. Some believe there is both ‘good’ and ‘bad’ stress while others prefer to see stress as only bad. They prefer to describe so called ‘good’ stress as pressure. This is important as the latest research has shown that the way you think about stress will have an impact on your approach to managing it. Important distinctions must also be made between stress, anxiety and depression to understand the most appropriate support whether that be coaching, therapy, clinical or another intervention. Finally it is also good to understand biological and physical responses to stress and your own personal experience of this. Through getting a better understanding about stress you will be in a much better place to manage it. By understanding the picture of where you want to be you can build greater motivation for wanting to get there. This motivation is key in driving you to change behaviour and habits. The more motivated you are to change the greater the chance of successful stress management. You may have many things that are causing your stress. Relationships, workload, travel to work, detrimental habits and more. By understanding and prioritising exactly what it is that causes your stress you’ll be better placed to develop strategies for managing them. To inform these strategies it will also be key to understand your response to these ‘stressors’ and how this manifests itself in your thoughts, feelings, physical condition and behaviours. Mapping out the costs of not changing and benefits if you do will further build motivation and provide you with the reasons you need to make progress. People react differently to stress. While one person may revel at skydiving 13,000 ft out of a plane for another this would seem like hell. These different reactions require different approaches and personal strategies based on what’s causing your stress. By taking responsibility and making a plan to change you are much more likely to succeed. Putting your plan into action and sticking to it is the hard part and this is where a coach can help. If you need help to manage stress consider the support of a stress coach. A coach can provide inspiration, support and challenge to help you on your way. 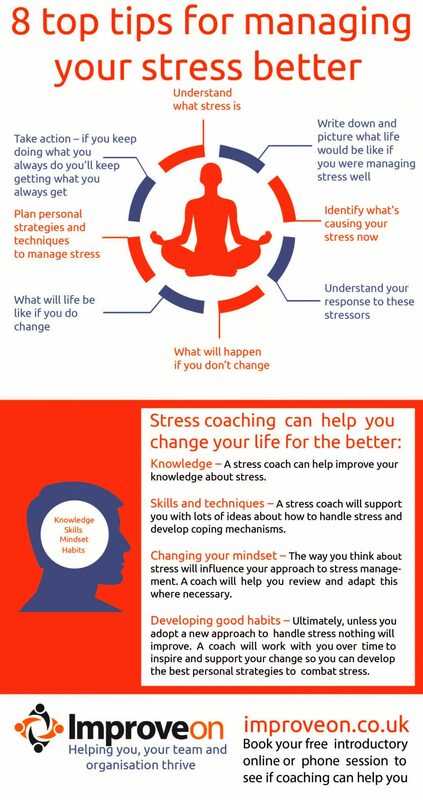 Find out more about the stress coaching service and book your free consultation.